Remember Charlie's Angels? Remember how no one ever knew what Charlie really looked like? Well, now you know. I am THE ONE AND ONLY CHARLIE. 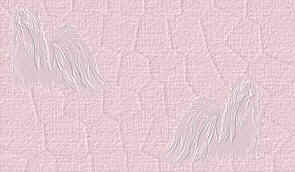 First my human angels left me and now the other dogs that I called my replacement angels are all getting adopted. The other dogs come and go, come and go, and I'm getting left behind. What's the deal? Let me tell you about my credentials and then perhaps you can tell me what I'm missing. First, I do not want to live with cats. No exceptions. Been there, done that, it doesn't work. Second, I'm perfectly housebroken and isn't that about one of THE MOST IMPORTANT traits of a dog? Third, I'm not fussy about my food which is more than the most dogs can say but I would request that you not feed me any of that cheap stuff because it's not good for any dog for many reasons. Foster Mom can make some good affordable suggestions. Fourth, I'm playful and will definitely provide you with adequate snuggling time. You may scratch my tummy as a thank you for my companionship. Oops, I forgot. I should be thanking YOU for adopting me and loving me. And I will do that, over and over again I will display my appreciation to you. Last, one classified piece of information - sometimes I mumble in my sleep. It's actually just my secret way of telling my original three angels about their next assignment so just pretend you didn't hear a word, OK? If I've forgotten anything just click on the link and ask your questions. Better yet, fill out the application and let's get on with life. Ahem, Ahem….my name is LEROY and that’s the perfect name for meeee! Leroy, in dog language, means love, joy and happiness! Well, that’s exactly what I am…all of those things! I am the most awesome-est of puppies…you see…I am only 7 months old and everything is interesting and fun!!! My brother is Wally and we just recently went into our foster homes. I currently have 4 other foster siblings—they are all small dogs…oh, and there’s a big fat cat too! I get along great with everybody…except for the cat…I love to bark at her and will chase her when I can—only because she is so funny looking! I have a big, deep bark for a smaller dog---just so you know! I am learning how to walk in a harness and I am pretty well crate trained and I am learning my potty manners and am making great progress because I am so smart and willing to learn new things! I am easy going, but I am a puppy and I need frequent potty breaks and lots of attention. During my first 7 months of life, I wasn’t around a lot of people, but now I am out and about and am getting more socialized. I am very curious about all of the people smells! I am not food or toy/bone aggressive and I love to chew on those pizzle bones…those are my favorites! My foster Mommy thinks that I would make a great addition to a somewhat active home…I really like to ride in the car and go for walks and go to the pet store! She also says that I have the cutest darn face and that the perfect Mommy or Daddy will find me! My name is Leroy and I BELIEVE IN LOVE! DO YOU?? Hi! I'm Wally, and I'm 7 months old. 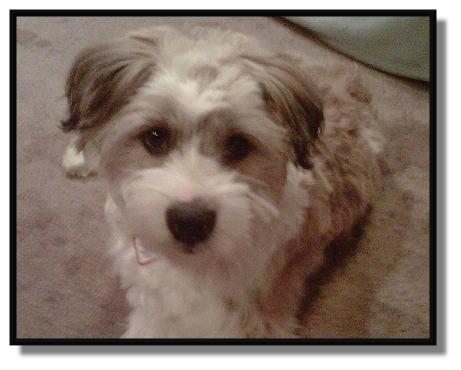 My foster mom was told I'm a Lhasa mix but she just calls me adorable mutt. I love to play with my foster mom and her dog Malia. When I'm not playing, I like to take a nap on foster mom's lap or just relax with a chew toy. If you want a smart and loving friend to share your life I might be the guy for you! "They left the country??? What do you mean they left the country? And they left me here? Really??? Oh, OK, so it's for a good cause but what am I going to do now?" 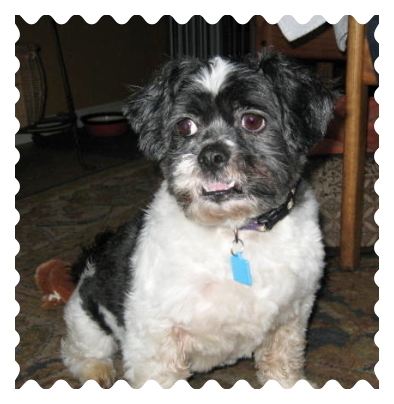 Yes, folks, Tai Tai was left in the care of rescue to find her the best of homes. The couple who loved her dearly and took care of her beautifully (as you can see) have gone overseas as missionaries and taking Tai Tai just wasn't an option. This is a very versatile dog. She has lived in a home with a yard, lived in an apartment, and an RV. Her favorite things are going for walks, and traveling so we want her in a home that will provide those things. She is NOT a barker which is a very nice quality in a small dog. She is totally housetrained, she would burst before she did anything in the house. She will not be happy living with bouncy dogs (young dogs) but she is fine living with dogs that are quiet and won't challenge her. She has been an only dog. Tai Tai is also kennel trained. Just say "kennel up" and she's in the crate ready to have the door closed and go to sleep. However, if you really want her to sleep with you that might take a bit of training.....like 30 seconds worth of training....or less. Tai Tai does have panic attacks on the 4th of July but most dogs need extra attention on that day. She is a very sensitive little girl and she is taking losing her home very hard. Wouldn't you, if you didn't understand the circumstances so please understand it will take her a few days to get into a comfort zone, and be part of the family. We believe if you just take her for walks and car rides, she will be fine in time...she just needs that one on one.....that one extra special person to mend her heart. My name is Marty. No one knows my original name as I was a stray with no history and no one came looking for me. I don't understand that because everyone who meets me adores me. I was in one of the shelters that, well let's just say, if you are not adopted in a short time, sadly you go to doggie heaven. No one wanted that to happen and Furbaby said "Let's give him a try", and I am told over and over how glad they are they did because I am so worth it. We cannot reflect on the past, just on the present. I am a great fellow, I know sit, rollover, and even if you just look at me, I lay down and ask for tummy rubs. 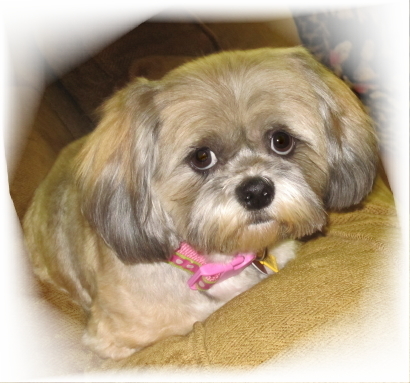 I am housetrained, I love toys, chews and I adore playing with other dogs. I can manage if I must be the only dog, if you pay attention to me. I have not once caused any problems in my foster home. I love both my foster Mom and Dad and easily share my affection. I happily sleep in a crate at night. All you have to say is "bedtime" and in I go and not a peep will you hear until you decide to get up and let me out. I never whimper, cry, or bark...but I do have one request, I really like the open wire crates, because I like to see everything...don't like the ones that are all closed in. So that is my one requirement. I am a goofy and happy boy who enjoys life. I listen so well to what is asked of me. One of my downfalls right now is grooming. I do really well for everything but my face. 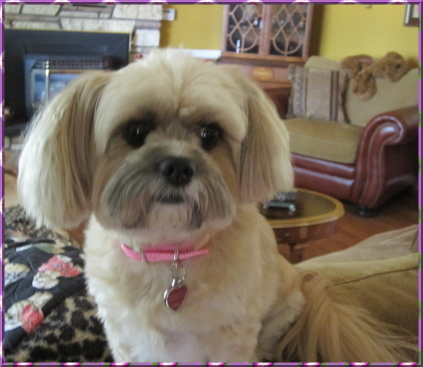 I just wasn't taught the grooming rules but I am getting better...so I will need a good groomer who understands Lhasa's. I am an amazing boy, I really am! I just need a home who knows my breed and instantly let's me know that you are in charge, and I will happily agree. I only want love, direction and please add a few toys and chews and I will be the best I can be. Promise!